Aquarium of the Pacific | Teacher Resources | Welcome Teachers! Home > Teacher Resources > Welcome Teachers! The Aquarium of the Pacific is ready to support your classroom curriculum with marine science related resources and is well positioned to support and train educators for the implementation of the Next Generation Science Standards (NGSS). The Education department has been working to identify, highlight, develop, and provide educators with programming and professional development opportunities that collectively contribute to the implementation of NGSS. Within this site you will also find resources developed to bring the ocean and hands-on science into your classroom, as well as resources that will help you get the most out of your time during your field trip to the Aquarium. We hope you keep coming back to see what new ideas and events we have to offer you. Story maps have been created to help students explore data and study the natural world around them through spatial visualization. The Aquarium also provides students/teachers tutorials and samples that guide them on building individualized story maps. These standards based educator-led programs are taught live to classrooms nationally and internationally through videoconferencing technology. 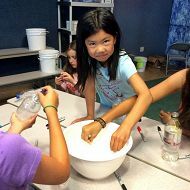 The Aquarium offers inquiry and standards based educational programs for preschool to college age students focused on marine science and climate change issues. The Aquarium’s guest scientist lecture series provide an opportunity to connect teachers with current science. Lectures are broadcasted live and archived to the Aquarium’s website. The Education department offers a variety of teacher workshops through the year including workshops specifically focused on data-driven classroom programming, robotic exploration of our oceans and planet, and NGSS implementation. In addition, the Education department leads a grant-funded week long intensive introduction to the Aquarium, Southern California’s diverse ecosystems, and current research being conducted by local scientist.